A House Of Cards is a concept that grew from events in the early 80′s and evolved into number of separate but cohesive parts of the AHOC Universe in various media and disciplines. Starting as a rock opera script and demo music done with live guitar, myself doing all vocal parts and composing all backing tracks for that iteration, I sent that to an old family friend and coworker on some of my landmark sized arts engineering projects. Not too long after I received back from Will Jones a novelized form bringing in all kinds of subplots and supporting characters and doing an exemplary satirical smackdown job hashing out the rock opera base archetypes into a mini novel “The Dross Factor”, that had me laughing out loud or doubled over in stitches paragraph after paragraph. When I had somewhat mastered 3D apps and rigging I created the cast of characters for a 3D movie and wrote a script combining the best storyline meshing mashup from both the rock opera and Will’s novelisation of the rock opera characters and world. Subsequently I have a game in development that is the first of a series of Mission Modules which are task specific RPG modules that are like comic books. The Mission Modules exist as stand alone episodes with a unique game mechanic and mnemonic mastery with the context of that episodes world or universe. I hope to take all the 3D characters, sets, objects and such and create a comic book in serialized format as well. Of course everything has it’s time and place so allow me to paint the picture of the set and settings this archetypal world. 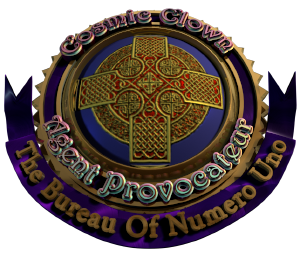 Below is the briefing given to each new Agent Provocateur Cosmic Clown upon entry into training with the Bureau Of Numero Uno. The political world of Archetypicon evolved from the natural planet of Ecosphere primarily as a matter of completely unnatural selection promulgated and controlled by a cabal of ancient manipulators and their evil mathematicians. Unlike the socially conscious and cosmically aware scientists and mathematicians of earlier years, who basically focused their energies on fundamental universal truths that helped Ecospherians develop their arts, sciences, and civilizations in a context born of natural law, the manipulators had the uncanny ability through advanced forms of mind control to almost completely invert natural law. They slowly developed a sophisticated series of asocial constructs and wars by the artful use of fiat currency and meticulously crafted layers of fear and propaganda, always acquiring greater levels of power with each perverse subversion. A classic downward spiral. The usurpation of technological evolution from the middle of Ecosphere’s industrial revolution into the high tech age that the planet presently exists in provided these dark manipulators with the tools required to create a planetary abattoir in which the primary use of invention is one that is relegated to rabid profiteering, constant conflict, and planetary destruction in the name of safety and progress. With the proscription of natural law many of the beings of Ecosphere became spiritually and cerebrally truncated enough to accept the constant omnipresent electromagnetic depravity that was programming them from cradle to grave, regardless of its obviously voracious and destructive nature. Many more were simply trapped by its malignant intricacies despite the realization of its falsity and found themselves trapped in societal limbo by flaw reinforcement bureaucracies and their almost endless matrices. This phenomenon was, as well, suffused into the theatrics of ‘higher learning’ in as much as most institutions no longer concerned themselves with scientific truths and universal values, and were compliant to the cadres of the criminally insane and their ersatz pecuniary machines and corporations. They had become essentially ‘diploma mills’ that destroyed education by teaching just enough politically corrected empirical knowledge to create proprietary biological units that would serve their corporate masters through debt and fear. Academic ‘products’ designed to produce yet larger mechanisms of control, deception, and illusory profit in order that the ‘producers’ might live the “good” life. Inculcated specialists controlled by corrupt corporate culture, controlled by corrupt corporate politicians, controlled by corrupt lawyers and bankers, ultimately controlled by a cabal of soulless organic constructs masquerading as humans. Certainly a very convoluted and dangerous state of affairs, and one that in terms of rectification is going to require the talents of a healthy contingent of spiritually advanced beings who know how to negotiate their way through the many traps and pitfalls that such a lethal culture generates. As the millennia slipped by and the darkness and manipulated violence became an integrated part of the evolution of various civilizations at varying rates there was always a presence and an ethical counterpoint, however invisible at times, to its seductive effluence. Every culture had its true shamans, priestesses, monks, scribes, and sacred orders that were dedicated to the gradual enlightenment and awakening of the populace through the darkened ages, and tasked to be of service in a larger capacity during the illuminating epochs when the frequencies of the heavens opened the portals of cosmic transience and allowed for the return of etherial justice and the righting of wrongs by mortals with divine assistance. Although a very ancient order that has been known by many names over the ages, the Bureau of Numero Uno was recently re-established as a quasi-governmental relief agency during ‘The Great Compression‘ between World Warp One and World Warp Two. It was so named as it was primary access point for many impoverished Archetypiconians to receive aid and occasional short-term employment. While being nondenominational and nonreligious it was of assistance in spiritual matters. While being a governmentally approved agency it was the only one concerned with the larger injustices that were so prevalent, while still showing genuine concern for many of the most down-trodden of Archetypicon. Its funding was always handled by anonymous benefactors and trusts, and since it handled no monies that could be usurped as all other ‘public‘ funds invariably were, it was allowed to continue its benign and publicly beneficial works, an effort that was often used by political opportunists to showcase what ‘noble works’ their otherwise crime-ridden and morally bereft administrations were responsible for. Since politicians and the bankers that owned them had no real understanding of anything that didn’t produce a profit they did at least possess the cunning and pragmatism to take credit for the good works of the Bureau of Numero Uno and in return allowed it to exist, a quid pro quo that had been accepted for decades by all players involved. As the tempo of cosmic energies quickened and the activities of the bureau became more directly involved with the concerns of the Head Honcho of the United Snakes of Archetypicon and his underlings (and overlings) there was more talk about ‘dealing‘ with the bureau in one format or another. As any power player knew this was easier said than done, as over the past seven decades the connectivity of the Bureau of Numero Uno was not only integrated on a planetary level, but in a more expansive cosmic context through private research foundations that had developed chronovariant technologies that were more sophisticated than those under the control of the Scientific Military Advanced Research Matrix (SMARM) and the Department of Casual Destruction (DCD). Very few, if any, in an official Archetypiconian capacity had any comprehension as to how the workings of the bureau were conducted, or where they were actually located, either geographically, or chronologically. They oftentimes referred to any number of adopted planets and dimensions as ‘Ecosphere’ as a matter of respect to the dynamics and powers of the Creator. This invisibility has allowed the Bureau of Numero Uno to continue training agents in various chronological dimensions and physical locations. They were and are trained within secure Natural Law mega-simulation facilities in order that they might develop the skills necessary to serve a higher cause as they traverse the space/time continuum. Their current missions are related to battling a cabal of head honchos and their pernicious mathematicians that have broadcasting a series of discordant pulse emanations that have sucked much of the life-force out of Archetypicon for several millennia, harvesting it and transmuting it for the dark Egregore of the planetoid Tentacula. Throughout the known universe the Agents of the Bureau of Numero Uno have been respected as comrades and etherial warriors by many beings for their noble efforts to thwart the diabolical darkness generated by various entities by utilizing both comedy and Natural Law. A classic case of ‘Parody vs. Paradigm‘. Many a nemesis has been cut down to size with a good mocking directed by a trained agent with a sharp wit that could utilize the metaphysical and physical tools and energetics of the 3-D laboratory universe. If you should accept the rigors and training and succeed in your mission then you too might proudly wear the Meritorious Tentacular Cross or the Medal of the Vanquished Egregore on your uniform as you prove yourself as a Cosmic Clown Agent Provocateur in even more challenging and life affirming missions in the future….or possibly in the past….. if so required and agreed to. Good luck, and remember…. knock ‘em dead!